Time once again to check in with the world of minor league baseball; it's Rick Chandler's Minor Enterprise! Today is the 38th anniversary of the first manned lunar landing; a fact that is not lost on the Kansas City T-Bones of the Independent Midwest League. The team is celebrating just a day late with Moon Night on Saturday. "Yeah, but plenty of professional baseball teams have honored the moon," you're probably saying. "What makes this so special?" 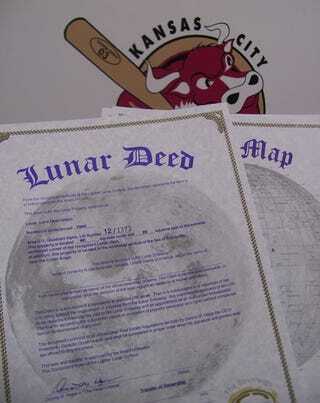 Well for one thing, the T-Bones will be giving away actual acres of moon real estate as prizes during between-inning contests. These moon deeds will be completely legal and documented, according to the team, and winners will even get a picture of their plot! Also, geologist, astronaut, and former U.S. Senator Harrison Schmitt — the 12th man to walk on the moon — will be on hand to throw out the first pitch and have a brief press conference. No shoving, girls, there's plenty of Sen. Schmitt to go around! Tom Brady Baby Shower Night, a gala Salute to Cheese and more, after the jump. • Bode Miller Night. Tuesday, July 24. Nashua Pride (Independent Canadian-American League). Yes that's Bode Miller making a leaping grab for the Pride in 2006, and he'll be suiting up again on Tuesday, for whatever reason, in the team's game against the New Haven County Cutters. He'll probably be hung over, and if you have a problem with that then just step off, dude. • David Eckstein Stepstool Night. Friday, July 20. Lowell Spinners (Class-A, New York-Penn League). According to the National Center for Health Statistics, average height for a male in the U.S. is 5-foot-9.2 inches. At 5-6, the Cardinals' shortstop may be slightly below average, but never fails to measure up in our hearts. If you are one of the first 1,500 fans in attendance, you get to take home a nifty Eckstein World Series MVP Step Stool. "If you're short like me, it's useful," said Eckstein, matter-of-factly. • Salute To Tom Seaver. Friday, July 20. Fresno Grizzlies (Class-AAA, Pacific Coast League). Seaver beat out Trent Dilfer, Bruce Bowen, David Carr and Ickey Woods in fan voting for the most famous Fresno native athlete. In April, Cher won the celebrity edition of the event. Now there's a pitching battery. • Tom Brady Baby Shower Night. Monday, July 23. Nashua Pride (Independent Canadian-American League). Come celebrate the Patriot quarterback's new bundle of joy, as the first 1,250 fans will receive a free baby bib. Also, a special mystery gift for selected women in attendance, which is how all of this happened in the first place. From reader Laura Dyer: "I personally am planning on skipping the baby shower and going to the game on Thursday, July 26 when special edition Rich "El Guapo" Garces Bobble-Bellies will be distributed to the first 2,000 fans." • Salute To Cheese. Monday, July 23. West Virginia Power (Class-A South Atlantic League). Cheese-related games and trivia are the order of the day as the Power honor the tasty comestible. • Sculpture Of The Week. This fine work of art has recently been installed at Hadlock Field, home of the Portland Sea Dogs (Class-AA Eastern League). It represents all that is good about baseball at the grass roots level; depicting a loving father, scalping the family's tickets despite objections from his son. And mom, apparently a former offensive lineman for the Jets, is reflecting on why her dress is three sizes too small. The wild child she is holding most definatley has several forms of ADD, and has been sedated heavily. And we suspect that the bear is real. • Headline Of The Week. Ha. I'm still giggling (yes, I'm 12). • Report From Bowie Baysox Bad Breath Night. In addition to causing physical damages to the young man's sinuses, we're sure that this assignment also took a large portion of his soul. We want your minor league tips! Send any photos, game reports or descriptions of your breath to RickChand@GMail.com. And thanks!